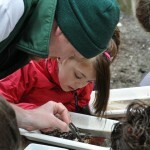 The Sitka Conservation Society provides diverse environmental education programs, which reach hundreds of people from preschool age through retirement age every year. Some of these programs are actually done in the classrooms of local schools, while other programs include public lectures, field classes, and even boat trips for the community at large. Be sure to check out our Calendar for upcoming lectures and educational events! The Backwoods and Waters series is a mix of wintertime lectures and summer boat trips to some of the most ecologically interesting and important places on the Tongass. It is an opportunity for Sitkans to learn about the natural history of their own home and abroad. The Sitka Conservation Society is engaging in an ambitious project to spread the word about the importance of salmon and wild salmon habitat to the environment and our way of life in Southeast Alaska. 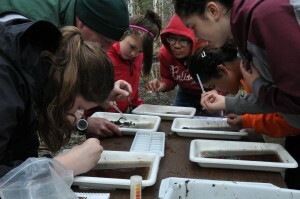 With funding from the Alaska Sustainable Salmon Fund, we are developing curriculum materials for educators, conducting teacher training workshops in monitoring stream health and water quality, developing a university-level course in watershed ecology, and airing hundreds of public service announcements on local radio stations. The richness of the Tongass National Forest and the waters of the Outer Coast make Sitka unlike any place. The dense forests, towering mountains, and waterways make this environment a unique classroom for youth to learn skills and respect for the land. It is our hope that students connect to this incredible environment through hands-on learning and leadership opportunities in the community. As the ninth largest seafood port in the country, Sitka is swimming with fish. Students should have access to this nutritious, local food that drives our economy and represents the interconnectedness of our community. Local fish lunches are served twice a month at local schools. The lunch program is served with a “Stream to Plate” curriculum, taking students through the cycle in which fish mature in our waterways, are harvested by local fishermen, undergo processing by our town’s thriving seafood processors, and finally grace our dinner table. Educating young people about energy issues is the best way to ensure an energy independent future for Sitka. The Sitka Conservation Society has begun visiting school classes to talk about energy. Lessons in the classroom visits include Sitka’s energy situation and conservation, fossil fuels in Alaska, home weatherization, and home and building energy audits. Baranof Island has one of the highest concentrations of brown bears in the world, and the Sitka Conservation Society is interested in seeing that bears and people coexist safely. The Bear Aware campaign strives to remind the public how to avoid unwanted bear encounters.